At the 2018 International Conference on Social Computing, Behavioral-Cultural Modeling, & Prediction and Behavior Representation in Modeling and Simulation (SBP-BRiMS), I presented a short paper titled “Formal Organizations, Informal Networks, and Work Flow: An Agent-Based Model” (PDF). The paper presents initial findings of a continuing project (view/follow project on ResearchGate) to develop and refine a generalized organizational agent-based model that includes both formal organization hierarchy (i.e., a so-called “organization chart”) and the informal networks that really matter in a company (i.e., what David Krackhardt and Jeffrey R. Hanson aptly called “the company behind the chart“). Such a generalized model would be useful to create simulations of a variety of individual and organizational processes at multiple levels (e.g., employees, managers, executives, and overall organization) and to precisely quantify processes as the simulations unfold. Initial findings from early model runs suggest potential decreases in both individual and organizational productivity as supervisory span-of-control increases in organizations with cultures of micromanagement. Below you can read the paper abstract and find out more information about the model. Few computational network models contrasting formal organization and informal networks have been published. A generalized organizational agent-based model (ABM) containing both formal organizational hierarchy and informal social networks was developed to simulate organizational processes that occur over both formal network ties and informal networks. Preliminary results from the current effort demonstrate “traffic jams” of work at the problematic middle manager level, which varies with the degree of micromanagement culture and supervisory span of control. Results also indicate that some informal network ties are used reciprocally while others are practically unidirectional. 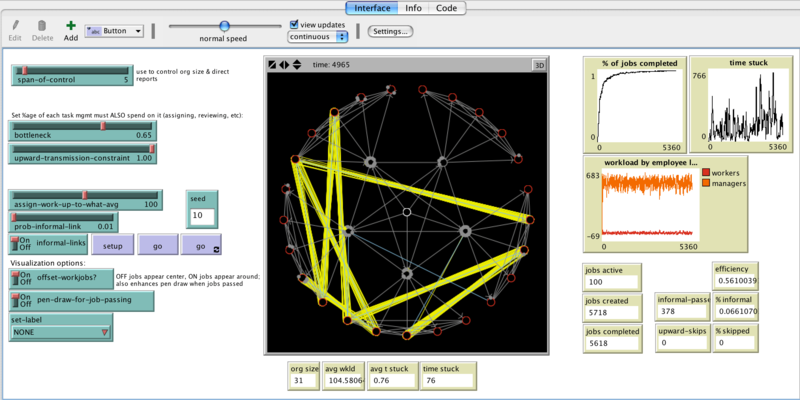 GUI of org networks model interface showing a small organization with span of control of 5. Yellow lines show “passes” of jobs using informal network ties when the formal hierarchy was inaccessible. My model will be made available under the Apache 2.0 license from OpenABM for others to use in their own research. Please feel free to use, refine, or extend this model with attribution.